Dr Lei Jin has a relatively long history in basic and translational cancer research. As a first/corresponding author, he has published research articles in high impact journals including Nature Cell Biology, PNAS, Nature Communications, Cancer Research and Oncogene. Since Dr Jin joined in HMRI in 2013, as the Chief Investigator A, he has attracted an National Health and Medical Research Council (NHMRC) project grant, 2 Hunter Medical Research Institute project grants and a Faculty of Health and Medicine Strategic Pilot Grant. In addition, as a Chief Investigator, Dr Jin has received a number of competitive grants from other sources including the National Natural Science Fund of China and Faculty of Health and Medicine. Particularly, he was awarded Hunter Translational Cancer Research Unit Fellowship in 2013 and a highly competitive Cancer Institute NSW Early Career Fellowship in 2014. Dr Jin has served as a reviewer to assess grant applications for national and international funding bodies including NHMRC and the National Natural Science Fund of China. He also has been invited to review manuscripts for a number of journals including Cancer Research, Oncogene, Neoplasia, Molecular Cancer Therapeutics, Molecular Cancer Research, and PLOS One. Dr Jin is a active member of several academic organizations, including American Association for Cancer Research (AACR), the Australia and New Zealand Melanoma Trials Group, Melanoma Institute Australia, and Hunter Medical Research Institute. Dr Jin has ongoing collaborations with a large number of researchers locally, nationally, and internationally. In particular, he has established productive collaborations with researchers in China. Dr Jin also provides a consultancy service to other researchers in Newcastle on molecular biology and biochemistry techniques. Dr Jin pioneered studies on “overcoming resistance mechanisms of melanoma cells to chemotherapy and targeted therapy”, which has provided a number of insights into resistance mechanisms of melanoma to cell death induced by various treatments. He was also among the first to show that p53 (a common tumour suppressor gene) played a pro-survival role in melanoma cells upon endoplasmic reticular stress (a type of cellular 'stress' that occurs in many types of cancer). More recently, Dr Jin has become a leading figure in investigation of the roles of non-coding RNAs in regulation of cancer cell survival, proliferation and metabolism. © 2017 The Authors Although the expression of programmed death-ligand 1 (PD-L1) is an important mechanism by which cancer cells evade the immune system, PD-L1 expression in cancer cells is commonly associated with patients¿ responses to treatment with anti-programmed death 1/PD-L1 antibodies. However, how PD-L1 expression is regulated in melanoma cells remains to be fully elucidated. Here we report that the class I histone deacetylase (HDAC) HDAC8 controls transcriptional activation of PD-L1 by a transcription complex consisting of transcription factors homeobox A5 and signal transducer and activator of transcription 3. Inhibition of HDAC8 upregulated PD-L1 in melanoma cells. This was due to an increase in the activity of a fragment of the PD-L1 gene promoter that is enriched with binding sites for both homeobox A5 and signal transducer and activator of transcription 3. Indeed, knockdown of homeobox A5 or signal transducer and activator of transcription 3 abolished upregulation of PD-L1 by HDAC8 inhibition. Moreover, homeobox A5 and signal transducer and activator of transcription 3 were physically associated and appeared interdependent in activating PD-L1 transcription. Functional studies showed that HDAC8-mediated regulation of PD-L1 expression participated in modulating anti-melanoma T-cell responses. Collectively, these results identify HDAC8 as an important epigenetic regulator of PD-L1 expression, with implications for better understanding of the interaction between melanoma cells and the immune system. © 2018 National Academy of Sciences. All Rights Reserved. Long noncoding RNAs (lncRNAs) function through a diverse array of mechanisms that are not presently fully understood. Here, we sought to find lncRNAs differentially regulated in cancer cells resistant to either TNF-related apoptosis-inducing ligand (TRAIL) or the Mcl-1 inhibitor UMI-77, agents that act through the extrinsic and intrinsic apoptotic pathways, respectively. This work identified a commonly up-regulated lncRNA, ovarian adenocarcinoma-amplified lncRNA (OVAAL), that conferred apoptotic resistance in multiple cancer types. Analysis of clinical samples revealed OVAAL expression was significantly increased in colorectal cancers and melanoma in comparison to the corresponding normal tissues. Functional investigations showed that OVAAL depletion significantly inhibited cancer cell proliferation and retarded tumor xenograft growth. Mechanically, OVAAL physically interacted with serine/threonine-protein kinase 3 (STK3), which, in turn, enhanced the binding between STK3 and Raf-1. The ternary complex OVAAL/STK3/Raf-1 enhanced the activation of the RAF protooncogene serine/threonine-protein kinase (RAF)/mito-gen-activated protein kinase kinase 1 (MEK)/ERK signaling cascade, thus promoting c-Myc¿mediated cell proliferation and Mcl-1¿mediated cell survival. On the other hand, depletion of OVAAL triggered cellular senescence through polypyrimidine tract-binding protein 1 (PTBP1)¿mediated p27 expression, which was regulated by competitive binding between OVAAL and p27 mRNA to PTBP1. Additionally, c-Myc was demonstrated to drive OVAAL transcription, indicating a positive feedback loop between c-Myc and OVAAL in controlling tumor growth. Taken together, these results reveal that OVAAL contributes to the survival of cancer cells through dual mechanisms controlling RAF/MEK/ERK signaling and p27-mediated cell senescence. © 2018 American Association for Cancer Research. Cancer cells in quiescence (G 0 phase) are resistant to death, and re-entry of quiescent cancer cells into the cell-cycle plays an important role in cancer recurrence. Here we show that two p53-responsive miRNAs utilize distinct but complementary mechanisms to promote cancer cell quiescence by facilitating stabilization of p27. Purified quiescent B16 mouse melanoma cells expressed higher levels of miRNA-27b-3p and miRNA-455-3p relative to their proliferating counterparts. Induction of quiescence resulted in increased levels of these miRNAs in diverse types of human cancer cell lines. Inhibition of miRNA-27b-3p or miRNA-455-3p reduced, whereas its overexpression increased, the proportion of quiescent cells in the population, indicating that these miRNAs promote cancer cell quiescence. Accordingly, cancer xenografts bearing miRNA-27b-3p or miRNA-455-3p mimics were retarded in growth. miRNA-27b-3p targeted cyclin-dependent kinase regulatory subunit 1 (CKS1B), leading to reduction in p27 polyubiquitination mediated by S-phase kinase-associated protein 2 (Skp2). miRNA-455-3p targeted CDK2-associated cullin domain 1 (CAC1), which enhanced CDK2-mediated phosphorylation of p27 necessary for its polyubiquitination. Of note, the gene encoding miRNA-27b-3p was embedded in the intron of the chromosome 9 open reading frame 3 gene that was transcriptionally activated by p53. Similarly, the host gene of miRNA-455-3p, collagen alpha-1 (XXVII) chain, was also a p53 transcriptional target. Collectively, our results identify miRNA-27b-3p and miRNA-455-3p as important regulators of cancer cell quiescence in response to p53 and suggest that manipulating miRNA-27b-3p and miRNA-455-3p may constitute novel therapeutic avenues for improving outcomes of cancer treatment. Significance: Two novel p53-responsive microRNAs whose distinct mechanisms of action both stabilize p27 to promote cell quiescence and may serve as therapeutic avenues for improving outcomes of cancer treatment. © 2017 Wiley Periodicals, Inc. Past studies have shown that mutant KRAS colon cancer cells are susceptible to apoptosis induced by the HSP90 inhibitor AUY922. Nevertheless, intrinsic and acquired resistance remains an obstacle for the potential application of the inhibitor in the treatment of the disease. Here we report that Mcl-1 is important for survival of colon cancer cells in the presence of AUY922. Mcl-1 was upregulated in mutant KRAS colon cancer cells selected for resistance to AUY922-induced apoptosis. This was due to its increased stability mediated by Bcl-2-associated athanogene domain 3 (BAG3), which was also increased in resistant colon cancer cells by heat shock factor 1 (HSF1) as a result of chronic endoplasmic reticulum (ER) stress. Functional investigations demonstrated that inhibition of Mcl-1, BAG3, or HSF1 triggered apoptosis in resistant colon cancer cells, and rendered AUY922-naïve colon cancer cells more sensitive to the inhibitor. Together, these results identify that the HSF1-BAG3-Mcl-1 signal axis is critical for protection of mutant KRAS colon cancer cells from AUY922-induced apoptosis, with potential implications for targeting HSF1/BAG3/Mcl-1 to improve the efficacy of AUY922 in the treatment of colon cancer. © 2018 The Author(s). Background: Adaptation to ER stress has been indicated to play an important role in resistance to therapy in human melanoma. However, the relationship between adaptation to ER stress and cell metastasis in human melanoma remains unclear. Methods: The relationship of adaptation to ER stress and cell metastasis was investigated using transwell and mouse metastasis assays. The potential molecular mechanism of KLF4 in regulating the adaptation to ER stress and cell metastasis was investigated using RNA sequencing analysis, q-RT-PCR and western blot assays. The transcriptional regulation of nucleobindin 2 (NUCB2) by KLF4 was identified using bioinformatic analysis, luciferase assay, and chromatin immunoprecipitation (ChIP). The clinical significance of KLF4 and NUCB2 was based on human tissue microarray (TMA) analysis. Results: Here, we demonstrated that KLF4 was induced by ER stress in melanoma cells, and increased KLF4 inhibited cell apoptosis and promoted cell metastasis. Further mechanistic studies revealed that KLF4 directly bound to the promoter of NUCB2, facilitating its transcription. Additionally, an increase in KLF4 promoted melanoma ER stress resistance, tumour growth and cell metastasis by regulating NCUB2 expression in vitro and in vivo. Elevated KLF4 was found in human melanoma tissues, which was associated with NUCB2 expression. Conclusion: Our data revealed that the promotion of ER stress resistance via the KLF4-NUCB2 axis is essential for melanoma cell metastasis, and KLF4 may be a promising specific target for melanoma therapy. © 2018 National Academy of Sciences.All Rights Reserved. The oncoprotein c-Myc plays an important role in regulating glycolysis under normoxia; yet, in cancer cells, HIF1a, which is essential for driving glycolysis under hypoxia, is often up-regulated even in the presence of oxygen. The relationship between these two major regulators of the Warburg effect remains to be fully defined. Here we demonstrate that regulation of a long noncoding RNA (lncRNA), named IDH1-AS1, enables c-Myc to collaborate with HIF1a in activating the Warburg effect under normoxia. c-Myc transcriptionally repressed IDH1-AS1, which, upon expression, promoted homodimerization of IDH1 and thus enhanced its enzymatic activity. This resulted in increased a-KG and decreased ROS production and subsequent HIF1a down-regulation, leading to attenuation of glycolysis. Hence, c-Myc repression of IDH1-AS1 promotes activation of the Warburg effect by HIF1a. As such, IDH1-AS1 overexpression inhibited cell proliferation, whereas silencing of IDH1-AS1 promoted cell proliferation and cancer xenograft growth. Restoring IDH1-AS1 expression may therefore represent a potential metabolic approach for cancer treatment. ©2017 AACR. MTH1 helps prevent misincorporation of ROS-damaged dNTPs into genomic DNA; however, there is little understanding of how MTH1 itself is regulated. Here, we report that MTH1 is regulated by polyubiquitination mediated by the E3 ligase Skp2. In melanoma cells, MTH1 was upregulated commonly mainly due to its improved stability caused by K63-linked polyubiquitination. Although Skp2 along with other components of the Skp1-Cullin-F-box (SCF) ubiquitin ligase complex was physically associated with MTH1, blocking the SCF function ablated MTH1 ubiquitination and expression. Conversely, overexpressing Skp2-elevated levels of MTH1 associated with an increase in its K63-linked ubiquitination. In melanoma cell lines and patient specimens, we observed a positive correlation of Skp2 and MTH1 expression. Mechanistic investigations showed that Skp2 limited DNA damage and apoptosis triggered by oxidative stress and that MAPK upregulated Skp2 and MTH1 to render cells more resistant to such stress. Collectively, our findings identify Skp2-mediated K63-linked polyubiquitination as a critical regulatory mechanism responsible for MTH1 upregulation in melanoma, with potential implications to target the MAPK/Skp2/MTH1 pathway to improve its treatment. © The Author 2015. Published by Oxford University Press on behalf of the European Society for Medical Oncology. All rights reserved. Evasion of immune system is a hallmark of cancer, which enables cancer cells to escape the attack from immune cells. Cancer cells can express many immune inhibitory signalling proteins to cause immune cell dysfunction and apoptosis. One of these inhibitory molecules is programmed death-ligand-1 (PD-L1), which binds to programmed death-1 (PD-1) expressed on T-cells, B-cells, dendritic cells and natural killer T-cells to suppress anti-cancer immunity. Therefore, anti-PD-L1 and anti-PD-1 antibodies have been used for the treatment of cancer, showing promising outcomes. However, only a proportion of patients respond to the treatments. Further understanding of the regulation of PD-L1 expression could be helpful for the improvement of anti-PD-L1 and anti-PD-1 treatments. Studies have shown that PD-L1 expression is regulated by signalling pathways, transcriptional factors and epigenetic factors. In this review, we summarise the recent progress of the regulation of PD-L1 expression in cancer cells and propose a regulatory model for unified explanation. Both PI3K and MAPK pathways are involved in PD-L1 regulation but the downstream molecules that control PD-L1 and cell proliferation may differ. Transcriptional factors hypoxia-inducible factor-1a and signal transducer and activation of transcription-3 act on the promoter of PD-L1 to regulate its expression. In addition, microRNAs including miR-570, miR-513, miR-197, miR-34a and miR-200 negatively regulate PD-L1. Clinically, it could increase treatment efficacy of targeted therapy by choosing those molecules that control both PD-L1 expression and cell proliferation. © 2016 American Association for Cancer Research. Oncogenic mutations of KRAS pose a great challenge in the treatment of colorectal cancer. Here we report that mutant KRAS colon cancer cells are nevertheless more susceptible to apoptosis induced by the HSP90 inhibitor AUY922 than those carrying wild-type KRAS. Although AUY922 inhibited HSP90 activity with comparable potency in colon cancer cells irrespective of their KRAS mutational statuses, those with mutant KRAS were markedly more sensitive to AUY922-induced apoptosis. This was associated with upregulation of the BH3-only proteins Bim, Bik, and PUMA.However, only Bim appeared essential, in that knockdown of Bim abolished, whereas knockdown of Bik or PUMA only moderately attenuated apoptosis induced by AUY922. Mechanistic investigations revealed that endoplasmic reticulum (ER) stress was responsible for AUY922-induced upregulation of Bim, which was inhibited by a chemical chaperone or overexpression of GRP78. Conversely, siRNA knockdown of GRP78 or XBP-1 enhanced AUY922-induced apoptosis. Remarkably, AUY922 inhibited the growth of mutant KRAS colon cancer xenografts through activation of Bim that was similarly associated with ER stress. Taken together, these results suggest that AUY922 is a promising drug in the treatment of mutant KRAS colon cancers, and the agents that enhance the apoptosis-inducing potential of Bimmaybe useful to improve the therapeutic efficacy. © 2016 The Authors The effect of MTH1 inhibition on cancer cell survival has been elusive. Here we report that although silencing of MTH1 does not affect survival of melanoma cells, TH588, one of the first-in-class MTH1 inhibitors, kills melanoma cells through apoptosis independently of its inhibitory effect on MTH1. Induction of apoptosis by TH588 was not alleviated by MTH1 overexpression or introduction of the bacterial homolog of MTH1 that has 8-oxodGTPase activity but cannot be inhibited by TH588, indicating that MTH1 inhibition is not the cause of TH588-induced killing of melanoma cells. Although knockdown of MTH1 did not impinge on the viability of melanoma cells, it rendered melanoma cells sensitive to apoptosis induced by the oxidative stress inducer elesclomol. Of note, treatment with elesclomol also enhanced TH588-induced apoptosis, whereas a reactive oxygen species scavenger or an antioxidant attenuated the apoptosis triggered by TH588. Indeed, the sensitivity of melanoma cells to TH588 was correlated with endogenous levels of reactive oxygen species. Collectively, these results indicate that the cytotoxicity of TH588 toward melanoma cells is not associated with its inhibitory effect on MTH1, although it is mediated by cellular production of ROS. Oncogenic mutations of BRAF occur in approximately 10% of colon cancers and are associated with their resistance to clinically available therapeutic drugs and poor prognosis of the patients. Here we report that colon cancer cells with mutant BRAF are also resistant to the heat shock protein 90 (HSP90) inhibitor AUY922, and that this is caused by rebound activation of ERK and Akt. Although AUY922 triggered rapid reduction in ERK and Akt activation in both wild-type and mutant BRAF colon cancer cells, activation of ERK and Akt rebounded shortly in the latter leading to resistance of the cells to AUY922-induced apoptosis. Reactivation of ERK was associated with the persistent expression of mutant BRAF, which, despite being a client of HSP90, was only partially degraded by AUY922, whereas reactivation of Akt was related to the activity of the HSP90 co-chaperone, cell division cycle 37 (CDC37), in that knockdown of CDC37 inhibited Akt reactivation in mutant colon cancer cells treated with AUY922. In support, as a HSP90 client protein, Akt was only diminished by AUY922 in wild-type but not mutant BRAF colon cancer cells. Collectively, these results reveal that reactivation of ERK and Akt associated respectively with the activity of mutant BRAF and CDC37 renders mutant BRAF colon cancer cells resistant to AUY922, with implications of co-targeting mutant BRAF and/or CDC37 and HSP90 in the treatment of mutant BRAF colon cancers. © 2016 Macmillan Publishers Limited. All rights reserved. Inositol polyphosphate 4-phosphatase type II (INPP4B) negatively regulates phosphatidylinositol 3-kinase signaling and is a tumor suppressor in some types of cancers. However, we have found that it is frequently upregulated in human colon cancer cells. Here we show that silencing of INPP4B blocks activation of Akt and serum-and glucocorticoid-regulated kinase 3 (SGK3), inhibits colon cancer cell proliferation and retards colon cancer xenograft growth. Conversely, overexpression of INPP4B increases proliferation and triggers anchorage-independent growth of normal colon epithelial cells. Moreover, we demonstrate that the effect of INPP4B on Akt and SGK3 is associated with inactivation of phosphate and tensin homolog through its protein phosphatase activity and that the increase in INPP4B is due to Ets-1-mediated transcriptional upregulation in colon cancer cells. Collectively, these results suggest that INPP4B may function as an oncogenic driver in colon cancer, with potential implications for targeting INPP4B as a novel approach to treat this disease. © 2014 John Wiley & Sons A/S. Targeting the sphingosine 1-phosphate (S1P)/S1P receptor (S1PR) signalling axis is emerging as a promising strategy in the treatment of cancer. However, the effect of such an approach on survival of human melanoma cells remains less understood. Here, we show that the sphingosine analogue FTY720 that functionally antagonises S1PRs kills human melanoma cells through a mechanism involving the vacuolar H+-ATPase activity. Moreover, we demonstrate that FTY720-triggered cell death is characterized by features of necrosis and is not dependent on receptor-interacting protein kinase 1 or lysosome cathepsins, nor was it associated with the activation of protein phosphatase 2A. Instead, it is mediated by increased production of reactive oxygen species and is antagonized by activation of autophagy. Collectively, these results suggest that FTY720 and its analogues are promising candidates for further development as new therapeutic agents in the treatment of melanoma. © 2015 AACR. Although many studies have uncovered an important role for the receptor-binding protein kinase RIP1 in controlling cell death signaling, its possible contributions to cancer pathogenesis have been little explored. Here, we report that RIP1 functions as an oncogenic driver in human melanoma. Although RIP1 was commonly upregulated in melanoma, RIP1 silencing inhibited melanoma cell proliferation in vitro and retarded the growth of melanoma xenografts in vivo. Conversely, while inducing apoptosis in a small proportion of melanoma cells, RIP1 overexpression enhanced proliferation in the remaining cells. Mechanistic investigations revealed that the proliferative effects of RIP1 overexpression were mediated by NF-¿B activation. Strikingly, ectopic expression of RIP1 enhanced the proliferation of primary melanocytes, triggering their anchorageindependent cell growth in an NF-¿B-dependent manner. We identified DNA copy-number gain and constitutive ubiquitination by a TNFa autocrine loop mechanism as two mechanisms of RIP1 upregulation in human melanomas. Collectively, our findings define RIP1 as an oncogenic driver in melanoma, with potential implications for targeting its NF-¿B-dependent activation mechanism as a novel approach to treat this disease. Reduction in the expression of the anti-survival BH3-only proteins PUMA and Bim is associated with the pathogenesis of melanoma. However, we have found that the expression of the other BH3-only protein Noxa is commonly upregulated in melanoma cells, and that this is driven by oncogenic activation of MEK/ERK. Immunohistochemistry studies showed that Noxa was expressed at higher levels in melanomas than nevi. Moreover, the expression of Noxa was increased in metastatic compared to primary melanomas, and in thick primaries compared to thin primaries. Inhibition of oncogenic BRAFV600E or MEK downregulated Noxa, whereas activation of MEK/ERK caused its upregulation. In addition, introduction of BRAFV600E increased Noxa expression in melanocytes. Upregulation of Noxa was due to a transcriptional increase mediated by cAMP responsive element binding protein, activation of which was also increased by MEK/ERK signaling in melanoma cells. Significantly, Noxa appeared necessary for constitutive activation of autophagy, albeit at low levels, by MEK/ERK in melanoma cells. Furthermore, it was required for autophagy activation that delayed apoptosis in melanoma cells undergoing nutrient deprivation. These results reveal that oncogenic activation of MEK/ERK drives Noxa expression to promote autophagy, and suggest that Noxa has an indirect anti-apoptosis role in melanoma cells under nutrient starvation conditions. © 2014 The Society for Investigative Dermatology. Epigenetic changes are widespread in melanoma and contribute to the pathogenic biology of this disease. In the present study, we show that I-BET151, which belongs to a new class of drugs that target the BET family of epigenetic "reader" proteins, inhibits melanoma growth in vivo and induced variable degrees of apoptosis in a panel of melanoma cells. Apoptosis was caspase dependent and associated with G1 cell cycle arrest. All melanoma cells tested had increased levels of the BH3 proapoptotic protein BIM, which appeared to be regulated by the BRD2 BET protein and to some extent by BRD3. In contrast, knockdown experiments indicated that inhibition of BRD4 was associated with decreased levels of BIM. Apoptosis was dependent on BIM in some but not all cell lines, indicating that other factors were determinants of apoptosis, such as downregulation of antiapoptotic proteins revealed in gene expression arrays. G1 cell cycle arrest appeared to be mediated by p21 and resulted from inhibition of the BRD4 protein. The activity of BET protein inhibitors appears independent of the BRAF and NRAS mutational status of melanoma, and further studies to assess their therapeutic role in melanoma are warranted. Cancer cells commonly undergo chronic endoplasmic reticulum (ER) stress, to which the cells have to adapt for survival and proliferation. We report here that in melanoma cells intrinsic activation of the ER stress response/unfolded protein response (UPR) is, at least in part, caused by increased outputs of protein synthesis driven by oncogenic activation of mitogen-activated protein kinase kinase/extracellular signal-regulated kinase (MEK/ERK) and promotes proliferation and protects against apoptosis induced by acute ER stress. Inhibition of oncogenic BRAF V600E or MEK-attenuated activation of inositol-requiring enzyme 1 (IRE1) and activating transcription factor 6 (ATF6) signaling of the UPR in melanoma cells. This was associated with decreased phosphorylation of eukaryotic initiation factor 4E (eIF4E) and nascent protein synthesis and was recapitulated by knockdown of eIF4E. In line with this, introduction of BRAF V600E into melanocytes led to increases in eIF4E phosphorylation and protein production and triggered activation of the UPR. Similar to knockdown of glucose-regulated protein 78 (GRP78), inhibition of XBP1 decelerated melanoma cell proliferation and enhanced apoptosis induced by the pharmacological ER stress inducers tunicamycin and thapasigargin. Collectively, these results reveal that potentiation of adaptation to chronic ER stress is another mechanism by which oncogenic activation of the MEK/ERK pathway promotes the pathogenesis of melanoma. © 2014 The Society for Investigative Dermatology. © 2014 Macmillan Publishers Limited. Akt is constitutively activated in up to 70% of human melanomas and has an important role in the pathogenesis of the disease. However, little is known about protein phosphatases that dephosphorylate and thereby inactivate it in melanoma cells. Here we report that suppression of pleckstrin homology domain and leucine-rich repeat Ser/Thr protein phosphatase 1 (PHLPP1) by DNA methylation promotes Akt activation and has an oncogenic role in melanoma. While it is commonly downregulated, overexpression of PHLPP1 reduces Akt activation and inhibits melanoma cell proliferation in vitro, and retards melanoma growth in a xenograft model. In contrast, knockdown of PHLPP1 increases Akt activation, enhances melanoma cell and melanocyte proliferation, and results in anchorage-independent growth of melanocytes. Suppression of PHLPP1 involves blockade of binding of the transcription factor Sp1 to the PHLPP1 promoter. Collectively, these results suggest that suppression of PHLPP1 by DNA methylation contributes to melanoma development and progression. Increased global protein synthesis and selective translation of mRNAs encoding proteins contributing to malignancy is common in cancer cells. This is often associated with elevated expression of eukaryotic translation initiation factor 4 (eIF4E), the rate-limiting factor of cap-dependent translation initiation. We report here that in human melanoma downregulation of miR-768-3p as a result of activation of the mitogen-activated protein kinase kinase (MEK)/extracellular signal-regulated kinase (ERK) pathway has an important role in the upregulation of eIF4E and enhancement in protein synthesis. Melanoma cells displayed increased nascent protein production and elevated eIF4E expression, which was associated with the downregulation of miR-768-3p that was predicted to target the 3&apos;-untranslated region of the eIF4E mRNA. Overexpression of miR-768-3p led to the downregulation of the endogenous eIF4E protein, reduction in nascent protein synthesis and inhibition of cell survival and proliferation. These effects were efficiently reversed when eIF4E was co-overexpressed in melanoma cells. On the other hand, introduction of anti-miR-768-3p into melanocytes upregulated endogenous eIF4E protein expression and increased global protein synthesis. Downregulation of miR-768-3p appeared to be mediated by activation of the MEK/ERK pathway, in that treatment of BRAF V600E melanoma cells with the mutant BRAF inhibitor PLX4720 or exposure of either BRAF V600E or wild-type BRAF melanoma cells to the MEK inhibitor U0126 resulted in the upregulation of miR-768-3p and inhibition of nascent protein synthesis. This inhibition was partially blocked in cells cointroduced with anti-miR-768-3p. Significantly, miR-768-3p was similarly downregulated, which was inversely associated with the expression levels of eIF4E in fresh melanoma isolates. Taken together, these results identify downregulation of miR-768-3p and subsequent upregulation of eIF4E as an important mechanism in addition to phosphorylation of eIF4E responsible for MEK/ERK-mediated enhancement of protein synthesis in melanoma. © 2014 Macmillan Publishers Limited. © 2014 John Wiley & Sons A/S. The transcription factor NF-kappaB (NF-kB) is a key regulator of cytokine and chemokine production in melanoma and is responsible for symptoms such as anorexia, fatigue, and weight loss. In addition, NF-kB is believed to contribute to progression of the disease by upregulation of cell cycle and anti-apoptotic genes and to contribute to resistance against targeted therapies and immunotherapy. In this study, we have examined the ability of the bromodomain and extra-terminal (BET) protein inhibitor I-BET151 to inhibit NF-kB in melanoma cells. We show that I-BET151 is a potent, selective inhibitor of a number of NF-kB target genes involved in induction of inflammation and cell cycle regulation and downregulates production of cytokines such as IL-6 and IL-8. SiRNA studies indicate that BRD2 is the main BET protein involved in regulation of NF-kB and that I-BET151 caused transcriptional downregulation of the NF-kB subunit p105/p50. These results suggest that BET inhibitors may have an important role in treatment of melanoma where activation of NF-kB may have a key pathogenic role. Past studies have shown that the inositol polyphosphate 5-phosphatase, phosphatidylinositol 4,5-bisphosphate 5-phosphatase (PIB5PA), is commonly downregulated or lost in melanomas, which contributes to elevated activation of phosphatidylinositol 3-kinase (PI3K)/Akt in melanoma cells. In this report, we provide evidence that PIB5PA deficiency plays a role in resistance of melanoma cells to RAF/mitogen-activated protein kinase kinase (MEK) inhibitors. Ectopic expression of PIB5PA enhanced apoptosis induced by the RAF inhibitor PLX4720 in BRAFV600E and by the MEK inhibitor U0126 in both BRAFV600E and wild-type BRAF melanoma cells. This was due to inhibition of PI3K/Akt, as co-introduction of an active form of Akt (myr-Akt) abolished the effect of over-expression of PIB5PA on apoptosis induced by PLX4720 or U0126. While overexpression of PIB5PA triggered activation of Bad and down-regulation of Mcl-1, knockdown of Bad or overexpression of Mcl-1 recapitulated, at least in part, the effect of myr-Akt, suggesting that regulation of Bad and Mcl-1 is involved in PIB5PA-mediated sen-sitization of melanoma cells to the inhibitors. The role of PIB5PA deficiency in BRAF inhibitor resistance was confirmed by knockdown of PIB5PA, which led to increased growth of BRAFV600E melanoma cells selected for resistance to PLX4720. Consistent with its role in vitro, overexpression of PIB5PA and the MEK inhibitor selumetinib cooperatively inhibited melanoma tumor growth in a xenograft model. Taken together, these results identify loss of PIB5PA as a novel resistance mechanism of melanoma to RAF/MEK inhibitors and suggest that restoration of PIB5PA may be a useful strategy to improve the therapeutic efficacy of the inhibitors in the treatment of melanoma. © 2013 Neoplasia Press, Inc. All rights reserved. Objective: To establish a model of ER stress-induced apoptosis with tunicamycin and to examine whether Bim is dysregulated and its potential role in resistance of melanoma cells to apoptosis under endoplasmic reticulum(ER) stress. Methods: A model of ER stress-induced apoptosis was established with tunicamycin. Apoptotic cells were quantitated using the annexin V/propidium iodide method by flow cytometry. Hoechst staining was also used to confirm the apoptotic cell death. Western blotting was used to measure the activation of caspase-3 and -9, and the expression of Bim, GRP78, CHOP, and Foxol at the protein level. The expression of Bim, CHOP and Foxol at the mRNA level was quantitated by qPCR. The siRNA technique was used to inhibit the expression of Bim. Results: Treatment of the melanoma cells with tunicamycin did not induce significant apoptosis and activation of caspase cascade, whereas it caused marked activation of caspase-3 and -9, and apoptosis in HEK293 cells which were used as a control. With exposure to tunicamycin (3 µmol/L) for 12, 24, 36 hours the Bim protein levels were not increased in Mel-RM and MM200 cells. Its mRNA levels were 0.37 ± 0.05, 0.13 ± 0.02 and 0.02 ± 0.01 in Mel-RM cells, while 0.41 ± 0.06, 0.16 ± 0.04 and 0.21 ± 0.03 in MM200 cells, respectively. The expression of Bim mRNA was significantly reduced compared with that in the control groups of the two cell lines (P < 0.01). siRNA knockdown of Bim protected HEK293 cells against activation of caspase-3. The cell apoptosis of Bim siRNA group was(5.69 ± 0.38)%, significantly lower than that of the siRNA control group (40.32 ± 1.64)% and blank control group (35.46 ± 2.01)% (P < 0.01). In the melanoma cells after exposure to tunicamycin (3 µmol/L) for 6, 12, 24, and 36 hours the transcription factor CHOP at mRNA level were significantly increased and the expressions at protein level were also up-regulated. The expressions of another transcription factor Foxol at mRNA level significantly decreased and the expressions at protein level were down-regulated, too. Conclusions: The lack of Bim up-regulation contributes to the resistance of melanoma cells to ER stress-induced apoptosis and may be a mechanism by which melanoma cells adapt to ER stress conditions. Transcription factors CHOP and Foxol may be responsible for the dysregulation of Bim in melanoma cells upon ER stress. 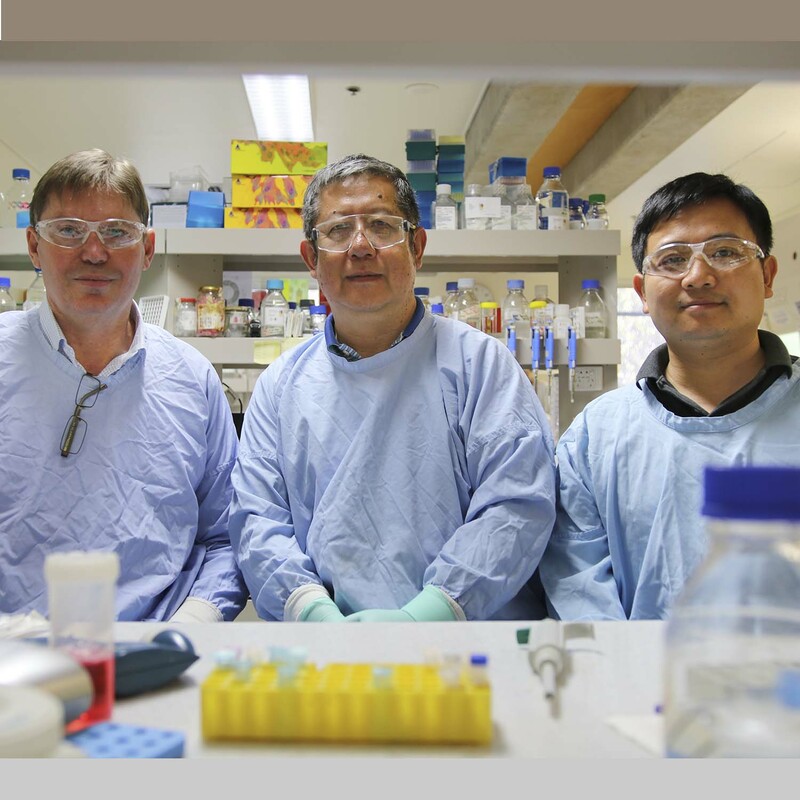 Researchers from the University of Newcastle have discovered two new cancer vulnerabilities by investigating a special class of genes known as noncoding RNA (ncRNA).